How Kenya’s “No Unga Tax” connected people to petitions in Nairobi through a missed call system. Kenyan activists put up over 100,000 posters across Nairobi displaying the phone number of a free call to sign a petition against adding taxes on basic commodities. Garbage collectors spontaneously travelled door-to-door handing out the posters. No one knows who organized them, it “just kind of happened,” says Alnoor Ladha. People were giving posters out in buses, and taxi drivers taped them in the back of their cabs. The campaign, dubbed “No Unga Tax” rallied organizations around a pressing national tax issue — a proposed bill that includes a 16 percent increase in Value-Added Tax (VAT) taxes on basic commodities. Unga, which means maize flour in Swahili, was one of the commodities up for taxation under the bill. Alnoor Ladha is co-founder and executive director at The Rules — a citizen-powered, global campaigning organization that facilitated the effort. Alnoor is also a board member of Greenpeace USA. He shares with MobLab some of the lessons from the campaign. The Rules is a collective of activists and organizers focusing on the root causes of inequality and poverty. To address the root causes of impoverishment, which are reinforced daily through the social, political and economic system, we must address the neoliberal capitalist system itself, says Alnoor. The Rules focuses on building a locus of power for this in key global South countries such as Brazil, India, South Africa, Kenya, Nigeria and Malaysia. “Part of the theory is with increasing economic power comes increasing political power and therefore increased citizen power. How do we work with existing social movements in those regions to really address the root causes?” asks Alnoor. The Rules helps run and coordinate major global campaigns, plays a regional role in campaigns, and builds community organizing infrastructure. The organization has borrowed elements from Occupy and the Indignados’ decentralized organizing model, as well as from online and mobile organizing. “We only work with existing social movements, so we aren’t running campaigns or petitions on our own in absence of real, grassroots energy around these issues,” Alnoor says. Alnoor says the No Unga Tax campaign was modest in cost, as the organization played a coordinating role. The Rules helped convene partner organizations, created teach-in materials, helped with translations, provided some community organizing support on-the-ground, provided creative materials like posters, wrote op-eds, facilitated an online petition, hired local media support for publicity, led the social media work, and provided some of technology tools like the mobile petition platform. The social movements that have the relationships were the ones that did the work, and The Rules supported them. A broad-based coalition including Bunge la Mwananchi (the People’s Parliament), Bunge la Wamama Mashinani (the Women’s Parliament), Disability Focus Africa (Kenya), Kamunkunji Youth Congress, Kenyan Asian Forum, Unga Revolution, Tax Justice Network Africa, East African Tax and Governance Network and the Kiambu Young Women Alliance. 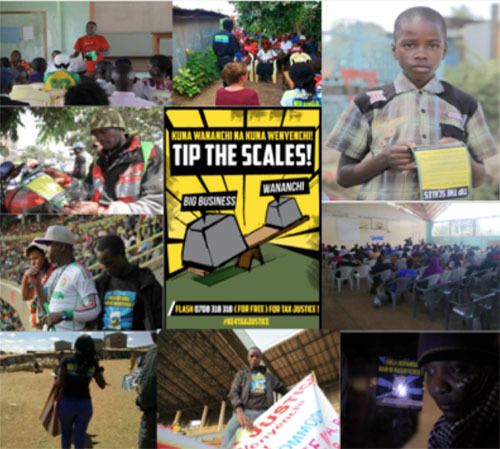 The coalition developed a shared narrative around the idea of reframing the tax from VAT to “Unga Tax.” A strategy was crafted to engage people across economic groups in Kenya around tax justice. The coalition participated in teach-ins to enable peer learning and harness people’s strengths. The coalition organized community forums across Nairobi as well as public outreach on buses, trains, at football games and through media. The campaign succeeded in seeing the removal of the 16 percent tax on basic commodities from the VAT Bill. Even though this felt like a huge win for civil society and social movements, the government found ways to increase the price of goods through other avenues such on the producer side, Alnoor notes. Other successes include gathering 76,358 signatures via Crowdring — a mobile petition platform using no-cost “missed calls” that The Rules developed — and generating strong media attention. The VAT bill entered national discourse with a poll showing Unga Tax as the No. 1 concern for Kenyans at 58 percent. 1. Creating deep community organizing infrastructure is essential. To create democratic change, all socio-economic classes need to discuss issues that affect them. By working with grassroots groups, the No Unga Tax campaign saw a wide variety of people involved, as demonstrated in the poster distribution. The Rules hired a respected full-time local organizer in Nairobi who played a central coordinating role. The organizer worked with The Rules’ Africa director to draw on her well-established local relationships. Working with existing social movements and civil society groups at an early stage in a project development is important. Northern NGOs may be hardwired to a fundraising model where they go into places and reinvent the wheel, Alnoor says. While these NGOs are good at campaigning there is a lack of organizing, which builds power and supports the groups doing the best work on the issue. “We have to understand that ordinary people living in their local context best know how to govern themselves,” he says, noting social movements and grassroots organizers should represent the legitimacy of people and the issues that affect them not foreign NGOs. 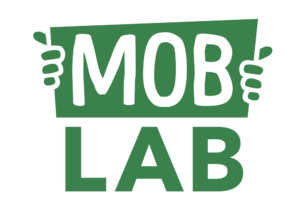 The campaign met its objective to test The Rules’ model of campaigning, with networks and allies creating a coherent, cohesive, horizontal coalition across issues with a range of organizations. 2. Technology alone isn’t enough — and doesn’t need to be high-tech. Though there is talk about how amazing and important technology is, Alnoor says at the end of the day it plays a 10 percent role. Technology doesn’t have to be high-tech: “You have to meet people where they are at,” he says. The Rules has developed Crowdring, a missed call platform. Missed calls are intentionally dropped phone calls that are logged by the recipient, but neither the caller nor the recipient pays any charges. Crowdring turns free missed calls into signatures on a petition, and works on any mobile phone. Locally, people use the flashing or beeping sound for missed calls to coordinate events. “What Crowdring brought was the local element. You didn’t need Internet access, you didn’t need a smart phone. It was participatory, it was democratic, it’s a behavior that people know,” Alnoor says. Crowdring marked the first use in Kenya of missed calls for a political means. This brought a novelty and accessibility factor, while using a technology people understood. The platform has the potential to be a scalable democratic tool for global South citizens. Some tech issues and problems with the telecom provider were setbacks, but the high response rate was a success. The Rules estimates that over 200,000 people dialed the number but SafariCom claimed there was only 76,358 as the servers went down for about 60% of the campaign time. 3. Telling the structural story is key to creating big changes. The No Unga Tax campaign sought to tell the larger story of Kenya becoming a tax haven, with evidence that the City of London was working towards this with the Kenyan government. This objective was less effectively achieved. However the larger story can be incrementally drawn out through further campaign phases. This shows the need to be flexible on how long it can take to link a local issue to a broader global system, another lesson learned through this campaign. “We have to stop thinking as environmentalists and start thinking as structuralists. Climate change is not man-made, it is capital made. Our current economic model is destroying our planet. Every dollar of wealth created not only creates injustice (as almost 90 cents goes to the top 1%), it also heats up the planet as we have an extractive, fossil-fuel based economy. And the great battle in the world right now is between corporate globalization and decentralization,” Alnoor says. 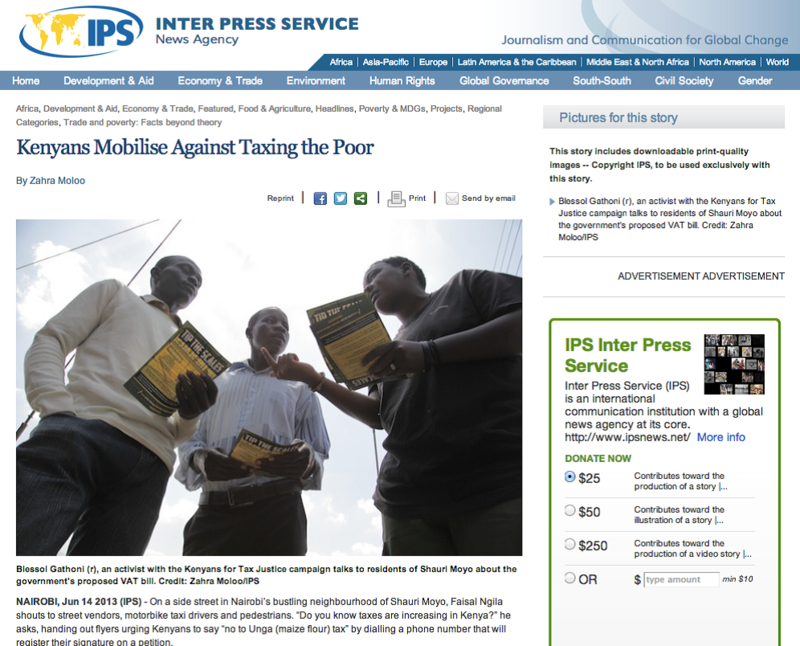 No Unga Tax received strong media attention, and was featured in a variety of publications including nationwide newspapers that referred to the campaign. People’s movements around the world, from the Arab Spring to Occupy to the Chilean Winter to the anti-corruption movements, to Idle No More (the Indigenous People’s movement), are all saying the same thing: We have an economic system that marginalizes the majority of the world’s people and is threatening Mother Earth at the same time, he says. 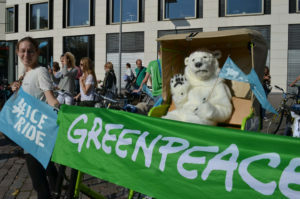 “If Greenpeace and NGOs want to address these issues we have to be much more radical. We can’t be scared to talk about ideology. I would say the most radical thought is to think that we can continue on our current path without the collapse of civilization as we know it,” Alnoor says. In February, The Rules joined about 200 activists, organizers and “artivists” — a term for the new hybrid cultural activists — for a two-week Artivism Lab. Held in a Nairobi community center, people engaged in workshops with leading writers, artists and technologists. Topics included conducting political teach-ins, using spoken word, creating protest music, writing and using digital tools.